Hot flashes and night sweats are some of the most common menopause symptoms that can last for many years. Natural remedies for hot flashes help to reduce the appearance of flushed red skin, excessive sweating, and a rapid heartbeat. Some good natural supplements for hot flashes include black cohosh, evening primrose oil, red clover, and vitamin E.
Apart from supplements that help treat hot flashes symptoms, there are also some effective essential oils for hot flashes. In fact, aromatherapy using oils such as lavender oil doesn’t just give you hot flash relief, but can also prevent hot flashes and nausea or having dizzy spells. Knowing how to stop night sweats and hot flashes can also reduce the need to use hormone replacement therapy (HRT). Many women are now turning to natural remedies for the menopause because of concerns over HRT side effects. In this article, you will find out the best hot flash remedies and how to stop night sweats. You will learn the best ways to prevent these menopause symptoms naturally. Hot flashes are a menopause symptom that causes sweating, a warm face, an increase in internal heat and possible shivering. In some countries, hot flashes are also referred to as hot flushes. 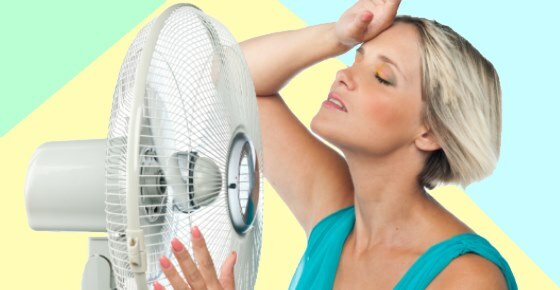 Most women say that hot flashes feel like an intense wave of heat that comes over them. The “heat wave” is usually felt first of all in the upper body and then spreads throughout the rest of the body. There are 2 different answers to the question of how long hot flashes last for. There is the length of the individual heat flash, and there is the period of time you can expect hot flashes and night sweats to last for. Let’s look in more detail at how you can stop hot flashes by using natural home remedies for symptoms of the menopause. One way to help stop night sweats naturally is to take vitamin E supplements. Learn more about how taking vitamin E supplements can also help to improve the appearance of your skin and hair during the menopause. If you suffer from hot flashes at night or during the daytime, taking folic acid could help to provide menopause relief. Learn more about the connection between folic acid and serotonin in your brain and how this can help you treat depression and anxiety naturally. Adding a serving of flaxseeds (also known as linseed) to your diet can help to reduce the symptoms of hot flashes and get rid of night sweats. When taking flaxseeds to shorten the length of time hot flashes last, it is important to buy whole flaxseeds. You should put them in a coffee grinder just before using them, as ground flaxseeds can go rancid quickly. Whole flaxseed may pass through your intestine undigested and that means you will not get all the benefits. You can add ground flaxseed to your yogurt or breakfast oatmeal or sprinkle on top of other dishes. Please read this article if you want to learn more about the amazing health benefits of consuming flaxseeds daily. One of the best herbs to take for hot flashes is valerian because it helps you cope with menopause symptoms. Valerian is also good to take if you suffer from night sweats. Apart from helping to regulate your hormones, valerian is one of the best herbal remedies that help you get to sleep. To find out more on helping to improve your sleep patterns while going through the menopause, please read my article on foods that make you sleepy. Taking valerian supplement along with some medications can increase the side effects of some medications, so talk to your doctor before taking valerian. One of the ways to relieve hot flashes is to take evening primrose oil capsules daily. Evening primrose oil is well-known for its benefits to feminine health. There is also a lot of scientific evidence that taking evening primrose oil can help to reduce the intensity of hot flashes. Find out more about the benefits of taking evening primrose oil pills to help improve symptoms of premenstrual syndrome. Red clover is a popular herb for the menopause that also helps to reduce symptoms such as severe hot flashes and vaginal dryness. Learn more about why taking red clover is good for you if you are going through the menopause. You will also find a delicious red clover tea recipe that you can make at home. One of the effective hot flash remedies that you can take to get natural menopause relief is passionflower extracts. Another way to address the causes of hot flashes and stop your body from becoming hot and sweaty during the menopause is to take chasteberry (vitex) extracts. You can learn more about how taking chasteberry tree extracts (vitex) can help balance hormone levels and also alleviate the discomfort of PMS. One menopause supplement that may help as a home remedy for hot flashes and night sweats is dong quai. The root of this traditional Chinese herb is usually combined with other herbs to treat women’s reproductive problems. Dong quai is such an effective remedy for treating pre and postmenopausal symptoms that it is also called female ginseng. Scientists recommend dong quai and chamomile as an alternative to what estrogen pills can do as a hormone replacement therapy. Apart from taking dong quai during the menopause, find out what other supplements help provide menopause relief. Another natural treatment for hot flashes after the menopause is to take maca root supplements. Maca is a plant that grows in the Andes Mountains and its root has medicinal properties similar to that of ginseng. Find out how maca can help to improve male and female sexual health and also help reduce anxiety. Soy products have an estrogen-like effect on the body and can help to regulate hormones during the menopause. However, some women are concerned about the risk of too many soy products increasing their risk of breast cancer. The research analyzed data from 483 women and found that the women reported lower frequency and severity of night sweats. The researchers commented that further studies are needed to conclude if omega-3 supplements are of benefit in alleviating vasomotor symptoms in menopausal women. Black cohosh for the menopause is one very popular supplement for helping hot flashes and other menopause symptoms. However, another study published in the medical journal Menopause found that taking black cohosh and red clover for a year didn’t result in any improvement in vasomotor symptoms. (9) Vasomotor symptoms are symptoms that relate to the constriction or dilatation of blood vessels. As well as taking supplements for hot flashes and sweating, there are also a number of essential oils that promote good health during the menopause. Many essential oils have compounds that mimic the effects of estrogen and can provide relief from the effects of poor sleep, hot flashes, and breast pain. Let’s look at two essential oils that help with hot flashes symptoms during the menopause – these are lavender and bitter orange essential oils. Lavender essential oil is a great all-around oil for treating many health complaints as well as relief from hot flashes. Inhaling bitter orange essential oil is another way to get relief from night sweats and hot flashes in menopausal women. Apple Cider Vinegar for Hot Flashes – Does it Work? Apple cider vinegar (ACV) is a popular home remedy for addressing a number of health issues. You may also be wondering if you can use apple cider vinegar as an effective remedy for hot flashes. While there is no scientific evidence to support the claims that apple cider vinegar helps hot flashes after the menopause, drinking a glass of diluted apple cider vinegar daily can help to boost your health. You can find out more about the health benefits of drinking apple cider vinegar every day. Apart from the many home remedies for dealing with night sweats and hot flashes that are mentioned in this article, there are some other ways you can help get relief from these menopause symptoms. I have to say that my biggest help has been to open my hands, ground my feet and allow the power of the hot flash to go out into the world and down into the Mother. A friend noticed that each time I had a hot flash I would hold it in, as it were, and contain it in my chest. She suggested that I let go and see if that didn’t help. It works every time for me and now I see my hot flashes as a gift of power that I share with the Universe. That’s another way to look at it. Different things work for different people. I have also been told that Organic Kale capsules work wonders within 24 hours. I was told by a dear friend of mine that hot flashes is a woman’s power surge and to embrace it till it washes over and thru me…I haven’t experienced them yet but does anyone else feel this way ? Ella I agree, it feels like you are burning from the inside out! I always drink very cold water at the time of hot flashes,it does help me to ease down. I agree with Ella, furthermore people that love and embraces their hot flashes are not having HOT-FLASHES, they are having warm flashes. My boyfriend and I can’t even sleep together any more because he makes me so hot I literally sweat the bed. I have mattress protectors on the bed so I don’t ruin the mattress. My boyfriend calls it “Flashing” and he thinks that He can cause me to have a hot flash when he touches me!It was amusing at first, til he realized “flashing” didn’t always mean “you turn me on” it also could me ” if you touch me again I’ll rip your arm off”. So I eat cold grapes. Keep a baggie next to the bed, and if I get hot he wakes up and feeds them to me. Omega 3s really helped me – I would eat salmon 3x a week and besides black cohosh I also took DIM – ask your Natural Grocers or Whole Foods supplements person about it ( or google it). And stay well hydrated. Try to give the treatment more time to see if it helps. The problem is that sometimes it takes time to see what works for you, and during this time of experimenting various solutions it can be very frustrating until you find the best solution for you. Sometimes there is not an easy answer. I hope you get well soon, and if something has helped you, don’t forget to share it with the readers. I use maca root and no more hot flashes! It is an adaptogenic herb which helps your body to actually regulate its own hormones. Donna how do you take the maca root? How long til you noticed results? I have been taking Red Clover tablet for a while now. It works for me . When I was in England at the herbalist shop they recommended Sage at night time so I am trying that. Also some Meno Tea. Chaste Tree Berry tablets/capsules (Vitex 1000) is a natural hormone balancer. Worked for me. I have read all the comments and will try many of the suggestions. I have just started with the symptoms of menopause especially the hot flashes and I can’t see myself just trying to deal. This is insane. Thank you for all the suggestions.